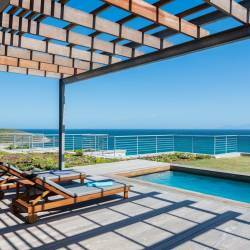 Amanzi Beach House in Umzumbe on the beautiful KZN South Coast is a magnificent beachfront house which is perched on a dune with endless beach and ocean views. Situated 100km South of Durban, the self-catering Amanzi Beach House is the ideal choice for a family and friends beach holiday. Beautifully and luxuriously styled in ‘beach-style’ décor, the 12 sleeper house offers generous living spaces and 180 degree views of the Indian Ocean. The house has 2 levels and comprises 5 comfortable bedrooms which can accommodate 10 adults and 2 children (making use of bunk beds in the 5th bedroom), 3 modern bathrooms (one of which is an en-suite to the main bedroom) and open plan kitchen/dining and lounge with full DSTV. Large glass sliding doors lead from the lounge to the furnished wooden deck, splash pool and braai (barbeque) area. 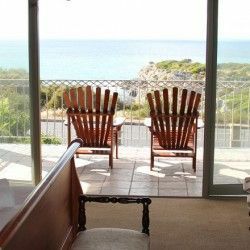 The perfect spot to watch the whales breach and the dolphins play. Additional amenities include a lift, making it suitable for wheelchairs, UPS back up in the event of a power failure, full maid service, complimentary Wi-Fi and CCTV with armed response. With direct beach access and a Blue Flag Swimming Beach within easy walking distance, Umzumbe is regarded as the best kept secret on the KwaZulu-Natal South Coast. The top attractions in the area are all within close proximity, whether you are a nature enthusiast, golfer, adrenalin seeker or prefer to relax and soak up the rays on the beach, Umzumbe is the place to be.